My very dear friend. For God sake do something for us. We are in a scrape and you can help us out of it, With my company, I reported here a fortnight ago last Saturday. Lieut. Col Miller, who is in command here, is a miserable drunkard. Yesterday (Sunday) he had the regiment out drilling from 8 o'clock till 11,20 A.M. He was so drunk that he could hardly sit in the saddle. He [?] us around the field, at a dead run and in utter drunken confusion. 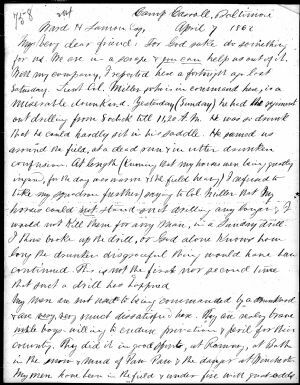 At length (knowing that my horses were being greatly injured, for the day was warm and the field heavy) I refused to take my squadron further saying to Col. Miller that my horses could not stand such drilling any longer & I would not kill them for any man, in a Sunday drill. I thus broke up the drill or God alone knows how long the drunken disgraceful thing would have been continued. This is not the first nor second time that such a drill has happened. The Huntington Library, San Marino, Calif.
Lieut. Col Miller was Andrew Galbraith Miller.